Is this just another way of making renewable energy even more expensive, or what? The claim is that this “is a great step forward in the creation of a truly decentralized energy system in the UK allowing end-users to balance the national electricity network at times of peak demand”. Cranking up the boilers at the power station is going out of fashion along with the power stations themselves, but the price is high due to subsidies, and security of electricity supply is uncertain. The world’s first grid-scale liquid air energy storage plant officially launched today, reports PEI. 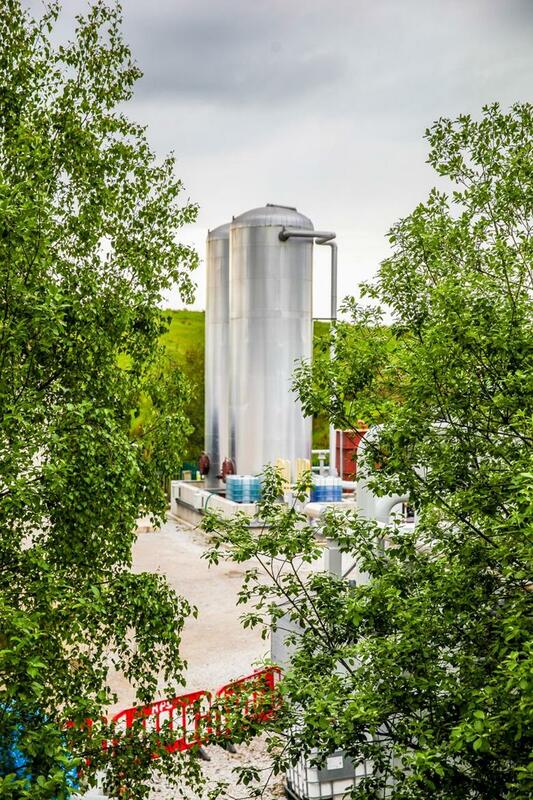 The 5MW/15MWh plant near Manchester in England will become the first operational demonstration of liquid air energy storage (LAES) technology at grid-scale. Professor John Loughhead, Chief Scientific Adviser at the UK government’s Department for Business, Energy and Industrial Strategy, officially switched on the plant, which has been developed by energy storage company Highview Power in partnership with recycling and renewable energy firm Viridor. LAES technology stores air as a liquid and then converts it back to a gas, involving an expansion process that releases stored energy, and this drives a turbine to generate electricity. In addition to providing energy storage, the LAES plant at Bury converts waste heat to power using heat from the onsite landfill gas engines. After the launch, demand response aggregator KiWi Power will be able to draw energy from the LAES plant to power about 5000 average-sized homes for around three hours. The plant will demonstrate how LAES can provide a number of reserve, grid balancing and regulation services. So when you compress the air it takes lots of energy, and it gets hot, you’ll have to remove that excess heat (energy lost?). When you vent the compressed air to the atmosphere, the liquid air in the tank rapidly cools, driving the turbine with very cold air. By what measure is this said to be efficient method of storing energy? So instead of converting the land fill gas engines energy straight to the grid electricity, inefficiently compress the air and store it. Professor Lumpenhead said “the deployment of stupid and expensive technologies to solve a non- problem of our own making, demonstrates our leadership in the world of insanity”. Highview Power’s process is 50 to 60 percent efficient—the liquid air can yield just over half as much electricity as it takes to make it. Batteries, by contrast, can be more than 90 percent efficient. But the new process can make up for its inefficiency by using waste heat from other processes (see “Audi to Make Fuel Using Solar Power”). Highview has demonstrated that low-temperature waste heat from power plants or even data centers can be used to help warm up the liquefied air. The system can also last for decades, while batteries typically need to be replaced every few years. This longevity could help reduce overall costs. In other words: A highly inefficient process that MIGHT be usable in a few niche areas with massive “waste” heat available for free. Rube Goldberg would be in awe of the Warmists! Professor Butts and the Self-Operating Napkin (1931). Soup spoon (A) is raised to mouth, pulling string (B) and thereby jerking ladle (C), which throws cracker (D) past parrot (E). Parrot jumps after cracker and perch (F) tilts, upsetting seeds (G) into pail (H). Extra weight in pail pulls cord (I), which opens and ignites lighter (J), setting off skyrocket (K), which causes sickle (L) to cut string (M), allowing pendulum with attached napkin to swing back and forth, thereby wiping chin. If the rocket scares the parrot off – game over. No exotic metals or harmful chemicals are involved and the process does not release any carbon emissions. The plant comprises mostly of steel, which has a lifespan of between 30 to 40 years, in comparison with 10 years for batteries. At the end of life, a LAES plant can be decommissioned and the steel recycled. LAES plants can be located at the point of demand which makes them highly flexible and able to supply energy to help urban areas keep the lights on. The one item that is conspicuous by its absence is where is the energy coming from to liquefy the air? Are they using diesel engines or do they hope to get it from the grid and who is paying for it? All we know is that the company rolled out one of the government’s useless academics to read the marketing blurb – I assume they couldn’t find a genuine engineer to do that without laughing his head off, not good for the marketing wonks or fooling the public. I suspect that the company’s answer will be that they will use excess renewable energy but where does it come from since the unreliables have produced almost nothing for the last week. Another government sponsored scam to relieve energy consumers of their money. Unbelievable stupidity on an epic scale. This is possibly the worst idea since sliced bread! We still have plenty of coal and oil / natural gas just waiting to be fracked. Using our natural resources would also be a good PR friendly way to save our interminably failing NHS. Babcock Ranch, near Fort Myers on state’s west coast, was developed from the beginning with a massive solar power farm generating 100 percent of the electric needs. About 350,000 photovoltaic solar panels stretch across a swath of land the size of 200 football fields. Somebody had to pay for those panels. Any subsidies? Yet again we see the difference between scientists and engineers exposed. This ‘technology’ by definition, has to be incredibly inefficient, and no serious engineer would support it. Its just so obviously a crock! But “Air” isn’t just one gas – it’s composed of many. When you cool down a mixture of gases they liquefy one by one, at different temperatures. That’s how the Oxygen for my welding torch is produced at the bottling plant. Does this LAES process simply keep going until ALL the constituents are in liquid form? Air was first liquefied by Carl von Linde. He used a very clever trick to use the use air cooled by expansion to pre-cool itself – a feedback effect that produced extremely low temperatures. They say they could build one 10 times larger with existing know-how. There fixed it for Prof. Lumpenhead. Who needs it when you can make petrol from air? TB: looks like an attempt to monetise the carbon cycle. Peugeot explains how government meddling killed its compressed air vehicle tech. oldbrew, Peugeot basically says that the lack of subsidies is what caused them to decide not to market the product. In other words, the compressed air hybrid wasn’t economically feasible on its own. It probably did get better gas mileage than a convention engine but the first cost outweighed any fuel savings over the life of the vehicle. What I don’t understand is why it isn’t economical to have say a compressed air brake regenerative system. Apply the brakes, use the action of an air compressor to slow down the vehicle and then touch the gas pedal to have the compressed air drive the wheels to initiate movement. I guess it would be too Rube Goldberg to have a heat exchanger on the exhaust manifold of a gas engine to heat a compressed air tank to recover some of the exhaust waste heat and then use that increase in pressure to power the drive train?